Just minutes west from Waikiki, this half-mile beach is protected by a fringing reef for calm waters. 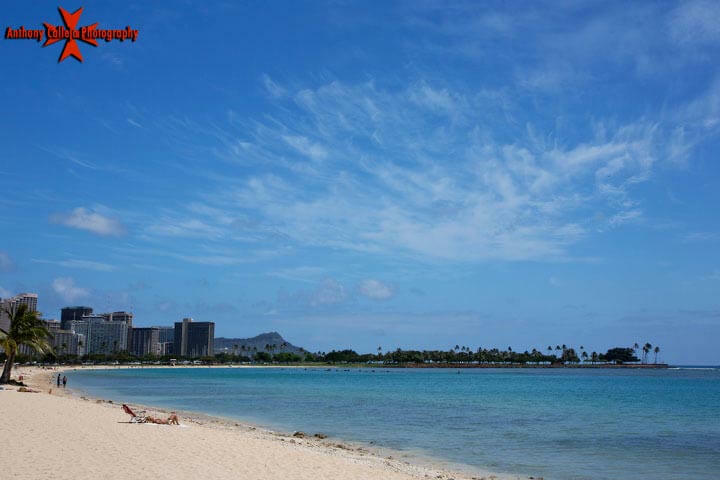 Extending out from the beach is Magic Island, a man-made peninsula with large seawalls and a shallow lagoon, making it a perfect place for keiki (children) to swim. Tables are available for picnics. Anthony Calleja Photography is a brand name for primary website anthonycalleja.com, a professional Honolulu photographers offering fun and affordable beach and sunset lifestyle photography for families and couples in Waikiki Oahu Hawaii. I specialize in First Birthday Pictures, Elopement Photographer, Family Beach Portraits, Couples Photography Ideas, Modeling Portfolios, Four Seasons Family Photographer, Oahu Surprise Proposals, Hawaii Maternity Photography, Oahu Senior Portraits, Honolulu Business Headshots, Oahu Engagement Photographers, Honolulu Photographers, Oahu Children Photography, Hawaii Sunset Photographer, Oahu Portrait Photographers, Hawaii Beach Photography, Hawaii Vacation Photos, Oahu Family Photographers, Waikiki Beach Portrait Photographer, Oahu Maternity Photographers, Hawaii Portrait Photographer, Hawaii Honeymoon Photographers, and more.